Martha Stewart - 4-Pc. Flex Mat Set, Created for Macy's Speed up prep work with these Martha Stewart Collection flex mats a set of four that lets you go from dicing veggies to slicing meat with stopping to clean a cutting board.
. - Bar Board With Groove Bar board with groove is perfect for cutting up fruits for cocktail parties. Keep it on your home bar so you can wow your guests with fruit garnishes. Martha Stewart - Set of 2 Rubberwood Grip Cutting Boards, Created f Get a grip. These rubberwood cutting boards come ready to stand their group with gripper feet on one side for slip-resistant cutting chopping & slicing. Epicurean - Cutting Board Bring a pop of practical color to your kitchen with this cutting board from Epicurean. The roomy board is dishwasher safe for easy cleanup. Epicurean - Kitchen Series Board 12 x 9 Slate Boasting a thin profile and a versatile design this kitchen essential is certain to make the cut. A built-in utility hole and a dishwasher-safe design provide easy storage and cleanup.
. - Square Cutting Board With Groove Square cutting board with groove is made of north-eastern hardwood. 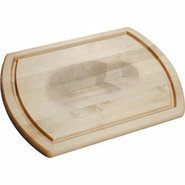 With a reversible design you can use this board for food prep or as a serving dish. John Boos - Chop N Slice Reversible Cutting Board A deep groove around the perimeter means less-mess carving with the Chop N Slice board from John Boos. In hard-rock maple it's reversible to help prevent cross-contamination.
. - Utility Board With Groove Utility board with groove is a great smaller board to use if you just want to cut up a quick fruit or vegetable or if you lack counter space for those larger boards. Martha Stewart - Citrus Cutting Board, Created for Macy's Brighten your workspace with this cheery lemon cutting board from Martha Stewart Collection. It's in knife-friendly rubber wood. Epicurean - Kitchen Series 15 x 11 Cutting Board Boasting a thin profile and a versatile design this kitchen essential is certain to make the cut. A built-in utility hole and a dishwasher-safe design provide easy storage and cleanup. Generic - Turnabout Reversible Carving Board This reversible maple cutting board is made for everyday meals and suitable for special occasions too! John Boos - Chop n Slice Reversible Maple Cutting Board Hard-rock maple brings a timeless look to this cutting board from John Boos. It's reversible to let you speed through prep with fewer worries about cross-contamination of food. Epicurean - Pig Cutting Board This little piggy makes prep work fun. Made from nonporous wood fiber this cute Epicurean cutting board gives you a roomy surface for slicing dicing or chopping. Epicurean - Natural 14.5 x 11.25 Non-Slip Series Cutting Boa Keep your prep work from sliding away with this non-slip cutting board from Epicurean. The 14.5 x 11.25 is part of the Natural line designed with food safety in mind. Generic - Traditional Maple Carving Board JK Adams cutting boards are known for their incredible quality and this one is no exception! Anolon - Pantryware Teak Wood 16 x 12 Cutting Board Solid teak wood brings beauty and durability to this cutting board from Anolon Pantryware. The 16 x 12 surface provides ample work room and also allows the board to double as a serving platter or trivet. Martha Stewart - Herringbone Cutting Board, Created for Macy's Varied tones of acacia wood come together in this herringbone-patterned cutting board from Martha Stewart Collection creating a practical and handsome surface for kitchen prep. Gripper feet help prevent slippage. Generic - JK Adams Maple Meat Lovers BBQ Cutting Board This large wooden cutting board can handle any size meat from your barbeque grill. Martha Stewart - Round Teak Cutting Board, Created for Macy's Natural wood grain lends a lovely rustic look to this teak cutting board from Martha Stewart Collection. It's also a stylish serving piece for a cheese tray or a stylish trivet for a buffet. John Boos - Maple Cutting Board The natural beauty of hard-rock maple brings a rustic accent to your kitchen with this cutting board from John Boos. JK Adams - 1761 Large Rectangular Cutting Board There's room for long baguettes and family-size briskets on this large cutting board. 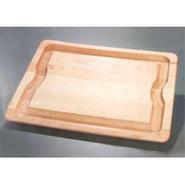 Part of the Jk Adams 1761 collection the rectangular board adds practical style to any kitchen. JK Adams - 12 x 12 End-Grain Chunk Board Created from end grain that helps protect your knives this 12 square chunk cutting board from Jk Adams gives you room to work and a great kitchen accent. John Boos - Reversible Maple Cutting Board There's room for a little more on this maple cutting board from John Boos. At 24 long it's perfect for slicing baguettes or bigger roasts. John Boos - Reversible Walnut Cutting Board Cut down on the prep work clean-up with this John Boos cutting board reversible to avoid cross-contamination. In walnut it features hand grips that help give you a secure hold. John Boos - Maple Cutting Board A substantial 3 that provides a sturdy platform for carving this John Boos cutting board is in durable maple with a stylish look. It's reversible to help avoid cross-contamination. 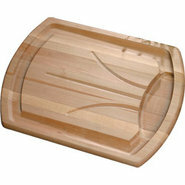 John Boos - Round Maple Cutting Board A thick platform perfect for carving this round cutting board from John Boos is in hard-rock maple for a stylish look.